New research finds that pension plans are a far more cost-efficient means of providing retirement income as compared to individual defined contribution accounts. The study calculates that the economic efficiencies embedded in defined benefit (DB) pensions enable these retirement plans to deliver the same retirement income at a 48% lower cost than 401(k)-type defined contribution (DC) accounts. Pool the longevity risks of large numbers of individuals to provide Americans with stable income that won’t run out in retirement. Said another way, pensions only have to save for the average life expectancy of a group of individuals. Absent a group retirement plan, individuals must save enough on their own should they be among the half of retirees who will live longer than the average life expectancy. 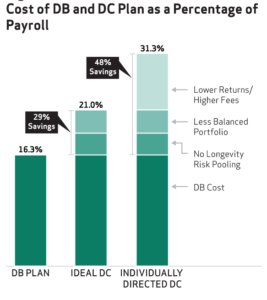 This DB pension longevity risk pooling feature generates a 10% cost savings. Are “ageless” and therefore can perpetually maintain an optimally balanced investment portfolio. In contrast, a typical individual investor must down shift investments over time to a lower risk portfolio of cash and bonds, sacrificing higher investment returns generated from stocks.This DB pension balanced portfolio feature generates an 11% cost savings. Achieve higher investment returns as compared to individual investors because they have lower fees and are managed by investment professionals. This lower fees and higher returns DB pension feature generates a 27% cost savings. 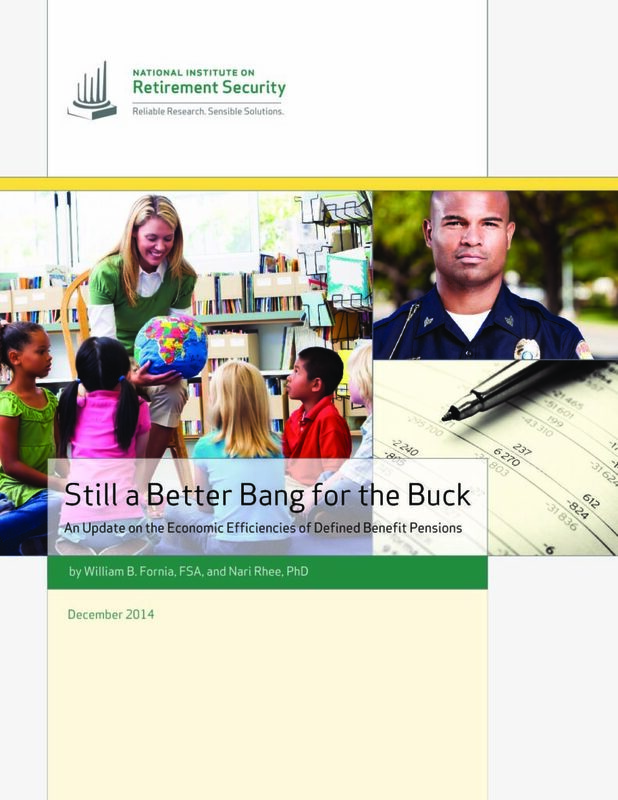 The report, Still a Better Bank for the Buck: Update on the Economic Efficiencies of Pension Plans, updates a 2008 NIRS study with similar findings. This new comparison of DB and DC plan costs takes into account recent developments in the retirement benefits landscape with regard to fees, investment strategies and annuities. It also builds an “apples to apples” comparison through a uniform set of demographic and economic assumptions.